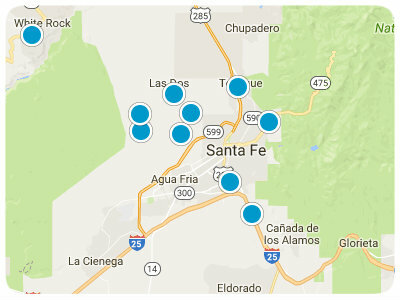 Nestled near Santa Fe’s dynamic downtown, the Casa Solana neighborhood is an excellent place to call home. This wonderful neighborhood has a lot to offer, including a fabulous location, beautiful landscaping, and a wide variety of homes that will appeal to homebuyers with varying budgets and architectural preferences. Mature trees and sidewalks are hallmarks of this neighborhood, and the community pool is also popular. Regardless of your interests, you will not struggle to find enjoyable activities that will complement your favorite pastimes. Available properties in Casa Solana are ready to impress you, so now is the time to consider what it would be like to live in this neighborhood. As a resident of this neighborhood, you will have ample entertainment opportunities at your fingertips. For example, if you enjoy spending time outdoors, then you will appreciate the close proximity of parks and natural areas. Invigorating hikes, exhilarating bike rides, relaxing strolls, and picnic lunches with astounding views can become part of your everyday life when you choose to live in Casa Solana. This neighborhood’s exceptional location ensures that you will also have easy access to metropolitan Santa Fe life, including the famed Plaza. Imagine dining in one of your favorite restaurants before attending a captivating live performance. You may also choose to attend a fun local event or festival, shop in eclectic boutiques, or tour an interesting museum or impressive art gallery. This city is known as a hub for the arts, so you will have ample chances to utilize your creativity. Lastly, if you have a dog, then you will want to spend time in the Frank Ortiz Dog Park, which borders this neighborhood. No matter where your adventures lead you, you will be content to think of your Casa Solana single-family home awaiting your return. A convenient location, lovely residences, and gorgeous scenery are only a few examples of what you will enjoy about living in this neighborhood. Homes for sale in Casa Solana are ready to pique your interest, and you are sure to find something that suits your style. If you are ready for more information regarding Casa Solana, Santa Fe, real estate options, please do not hesitate to contact us.